The Accu-Tab® water treatment system from Axiall Corporation simplifies chlorination equipment maintenance for operators at aquatics of all sizes. The NSF/ANSI 50 certified tablet erosion system stands up to the challenges of commercial pool environments by providing consistent deliver of chlorine. There are many units from which to choose and options available to integrate with all controller systems. 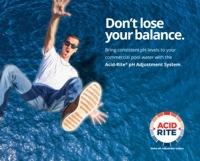 Manufactured by the makers of Accu-Tab® — a pioneer in tablet erosion technology — the Acid-Rite® pH Adjustment System is helping owners of aquatic facilities bring balance to both their water and their work life. Virtually maintenance free, the Acid-Rite tablet-based system is the smart alternative to bulky liquid acid drums, cumbersome sodium bisulfate bags and alkalinity struggles associated with CO2 systems. Acid-Rite is NSF 50 Listed too! See the Acid-Rite Advantage for yourself. Learn more at acidrite.com.